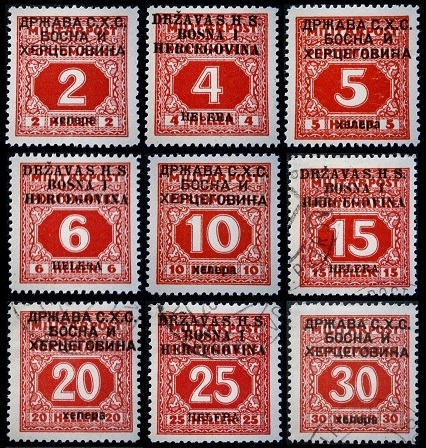 New Yugoslavia provisional stamps for use in Bosnia and Herzegovina appeared in 1918. The Kingdom of the Serbs, Croats, and Slovenes, which would become the Kingdom of Yugoslavia, was formed from the Balkan Peninsula states of the Austro-Hungarian Empire in the aftermath of World War I. As federal postage stamps for the new Kingdom of Yugoslavia would not be ready for another two years, Bosnia and Herzegovina began overprinting existing inventories of contemporary Austrian Empire - Bosnia and Herzegovina postage stamps for use in their region of the new kingdom. With their economy having been based on the Austrian Krone, the new postage stamps were all denominated in Heller and Kroner. For earlier stamps of Bosnia and Herzegovina, please see the Austria - Empire category of this website. 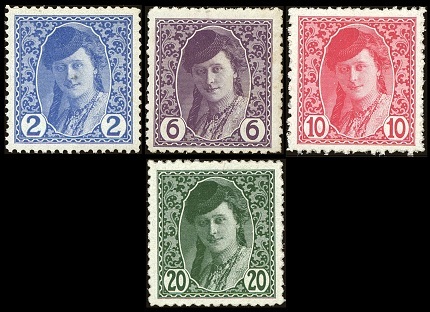 The overprints on all of these 1918 Bosnia and Herzegovina provisional stamps are as follows. Država S.H.S. (Slovenaca, Hrvata i Srba) or Држава С.Х.С. (Словенаца, Хрвата и Хрба), which means "States of the Slovenes, Croats, and Serbs". Bosna i Hercegovina or Боснa и Херцеговина, which means "Bosnia and Herzegovina". Many errors, including doubled and inverted overprints, exist on most of the provisional Bosnia and Herzegovina stamps. 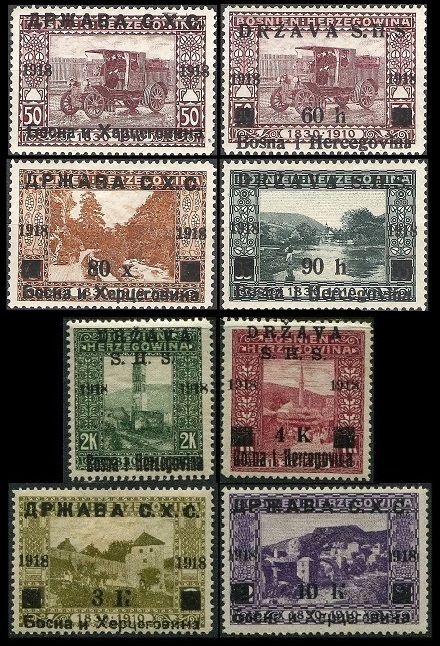 The sixteen overprinted and / or re-valued Yugoslavia provisional stamps for Bosnia and Herzegovina shown above were issued on November 11, 1918, the day that World War I ended. They are engraved and perforated 12 1/2. These pictorial commemorative stamps were originally issued by Bosnia and Herzegovina in 1910 to celebrate the 80th Birthday of Austrian Emperor Franz Josef I (Lived: 1830-1916, Reigned: 1848-1916). The original designs are as follows. 03 H. (1918 - Sc. #1L1) - Olive Green. 05 H. (1918 - Sc. #1L2) - Dark Green. 10 H. (1918 - Sc. #1L3) - Carmine. 20 H. (1918 - Sc. #1L4) - Dark Brown. 25 H. (1918 - Sc. #1L5) - Deep Blue. 30 H. (1918 - Sc. #1L6) - Green. 40 H. (1918 - Sc. #1L7) - Orange. 45 H. (1918 - Sc. #1L8) - Brown Red. 50 H. (1918 - Sc. #1L9) - Dull Violet. 60 H. on 50 H. (1918 - Sc. #1L10) - Dull Violet. 80 H. on 06 H. (1918 - Sc. #1L11) - Orange Brown. 90 H. on 35 H. (1918 - Sc. #1L12) - Myrtle Green. 02 K. (1918 - Sc. #1L13) - Gray Green. 03 K. on 03 H. (1918 - Sc. #1L14) - Olive Green. 04 K. on 01 K. (1918 - Sc. #1L15) - Maroon. 10 K. on 02 H. (1918 - Sc. #1L16) - Violet. 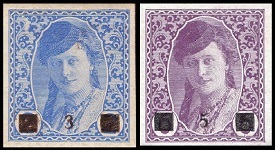 The two Bosnia and Herzegovina newspaper stamps shown above were overprinted and re-valued for use as provisional postage stamps in December 1918. They are typographed and imperforate. 03 H. on 02 H. (1918 - Sc. #1L21) - Ultramarine. 05 H. on 06 H. (1918 - Sc. #1L22) - Violet. 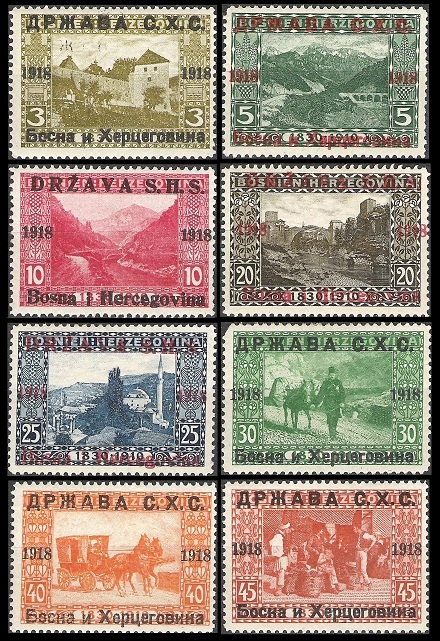 The four pictorial definitive Yugoslavia provisional stamps for Bosnia and Herzegovina shown above were issued on February 1, 1919. They are typographed and perforated 11 1/2. The common design features a Bosnian girl. Imperforate examples of these stamps are Bosnia and Herzegovina newspaper stamps issued in 1913. 02 H. (1918 - Sc. #1L17) - Ultramarine. 06 H. (1918 - Sc. #1L18) - Violet. 10 H. (1918 - Sc. #1L19) - Rose. 20 H. (1918 - Sc. #1L20) - Green. The thirteen overprinted Yugoslavia provisional postage due stamps for Bosnia and Herzegovina shown above were issued on December 13, 1918. They are typographed and perforated 12 1/2 or 13. 02 H. (1918 - Sc. #1LJ1) - Red. 04 H. (1918 - Sc. #1LJ2) - Red. 05 H. (1918 - Sc. #1LJ3) - Red. 06 H. (1918 - Sc. #1LJ4) - Red. 10 H. (1918 - Sc. #1LJ5) - Red. 15 H. (1918 - Sc. #1LJ6) - Red. 20 H. (1918 - Sc. #1LJ7) - Red. 25 H. (1918 - Sc. #1LJ8) - Red. 30 H. (1918 - Sc. #1LJ9) - Red. 40 H. (1918 - Sc. #1LJ10) - Red. 50 H. (1918 - Sc. #1LJ11) - Red. 01 K. (1918 - Sc. #1LJ12) - Dark Blue. 03 K. (1918 - Sc. #1LJ13) - Dark Blue. The two overprinted Yugoslavia provisional charity stamps for Bosnia and Herzegovina shown above (Sc. #1LB1-1LB2) were issued in December 1918. They are engraved and perforated 12 1/2 or 13. The proceeds from the sale of these stamps benefited veterans of World War I. The two overprinted Yugoslavia provisional charity stamps for Bosnia and Herzegovina shown above (Sc. #1LB3-1LB4) were issued on December 28, 1918. They are engraved and perforated 12 1/2 or 13. 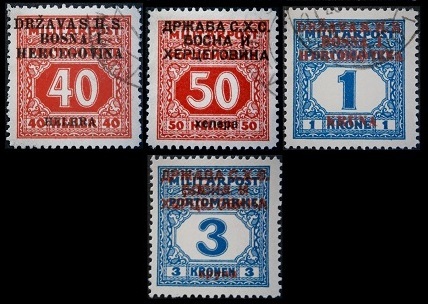 The two overprinted Yugoslavia provisional special delivery stamps for Bosnia and Herzegovina shown above (Sc. #1LE1-1LE2) were issued on December 13, 1918. They are engraved and perforated 12 1/2 or 13.